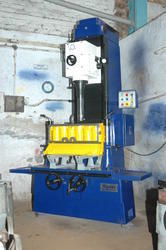 Prominent & Leading Exporter from New Delhi, we offer vertical fine boring machine. Our company is involved in the manufacture, export and supply of optimal quality Vertical Fine Boring Machines, which is manufactured by our machines with strict quality control process that gives the range, years of trouble-free operations. In addition to this, we also offer customized solutions to our clients as per their needs and demands and offer these machines at most competitive prices. Spindle feeds per revolution 0.002", 0.004", 0.006"
Two tool holders for boring. Portable grinder with suitable grinding/Lapping wheels. Two sets of parallel blocks. Height 150 mm & 65 mm. A set of service spanners. Single spindle having boring range dia 64-135 mm. Two quick clamping fixtures with buckle for cylinder blocks. Looking for Vertical Fine Boring Machines ?